You may find it easier to analyse data that you have collected in PDF forms in Excel or any other format. In this case, you need to export data from PDF form to Excel on your Mac. To export PDF form data to Excel Mac is a walk in the park if you have the right tool. 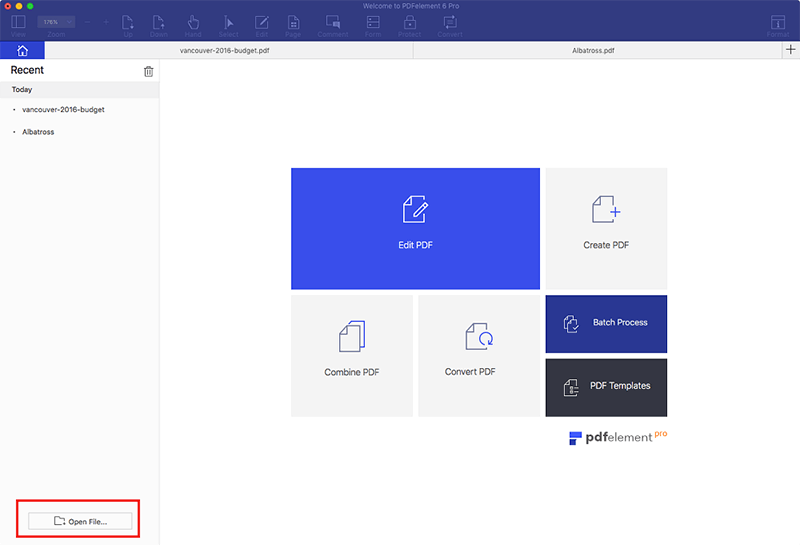 This article explains to you how to export PDF form data to Excel on Mac (including macOS Mojave) with PDFelement for Mac to help you. 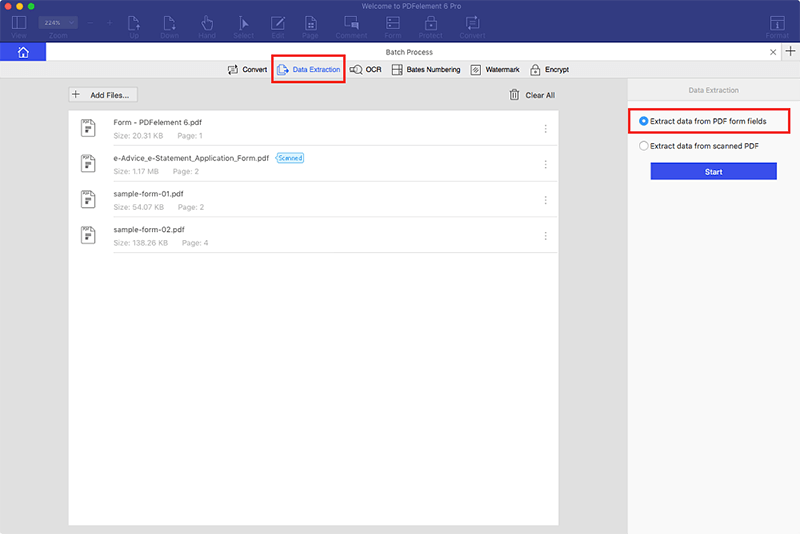 PDFelement for Mac is an all in one PDF tool that allows you to export PDF form data Mac, extract data from PDF forms, create fillable PDF forms as well as filling out PDF forms. It is time saving and efficient since it supports batch process like batch data extraction, watermark, encryption, OCR and bates numbering. PDFelement also allows you to sign your PDF forms and PDF with a digital signature. It is full compatible with macOS 10.14 (Mojave), 10.13, 10.12, 10.11, 10.10. 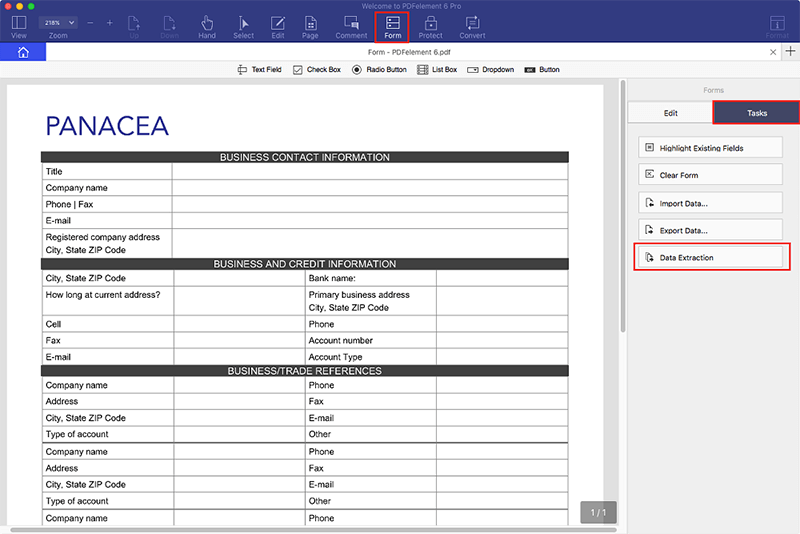 To export data from PDF form to Microsoft Excel spreadsheet, you need to download PDFelement for Mac and install it on your Mac. From there you can now keenly follow these simple steps. On your Mac go to Applications and launch PDFelement. Next, you need to upload your PDF form. Click on "Open File" button and a pop window will appear that allows you to select PDF form to upload. Once the PDF form is uploaded to the program, navigate the cursor to the top of the screen and click on "Form". A panel will appear at the right hand of the screen. Click the "Tasks" tab and scroll down and click on the "Data Extraction" button. A dialogue box will appear that allows you to add more PDF forms for data extraction. Tick the option "Extract data from PDF form fields". Finally click "Start" to export data to CSV file. After the process, you can click "Find" to open the spreadsheets.